These interviews were conducted by Ed O'Brien. In the first, Jake Holmes (lyricist for Watertown) comments on each song, and in the second Bob Gaudio (composer/producer) has his say. "Everything evolved from that piece ('Goodbye'). It was such an interesting concept- a man left by his wife. He has two young boys. The story really intrigued me. 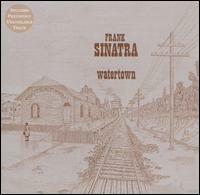 It was Bob's (Gaudio) idea to call it Watertown. He got it off a map of New York State." WATERTOWN: "I had in mind a model of 'Lazy Afternoon.' I wanted a languid feeling. If we had done the TV special, it would have opened it up, with the credits going by." GOODBYE: "I love the idea of those kinds of goodbyes that people have where nothing is happening emotionally. It knocks me out when there is nothing on the surface." FOR A WHILE: "I've always felt that there is that moment in your life, when you forget about something that is really terrible. For five minutes the sun is shining and everything is beautiful. Then all of a sudden you realize that the person you cared about is gone, and it all comes back...one of those little holes in grief when it becomes even more painful." MICHAEL & PETER: "Gaudio's kids were the models for that song. I put it in letter form, because it was the only way the guy could articulate those sentiments to her." I WOULD BE IN LOVE (ANYWAY): "It's that you can't regret where you are even if life takes you someplace where you don't want to be...it was this guy trying to let go of this woman without being angry with her...he was never really angry at her. He kind of understood; she had to go." ELIZABETH: "I just love that name. I just imagined a girl named Elizabeth and wrote words that were a tribute to her." WHAT A FUNNY GIRL (YOU USED TO BE): "It was a retrospective song. I also wanted to indicate in the song that they had been childhood sweethearts. They were probably kids together...had gone to school together...had fallen in love and married quite young." WHAT'S NOW IS NOW: "...an indication that she had obviously gone with somebody else. She has had a relationship, and he hadn't been able to accept it. That is partly what drove her off to the big city. There is a guilt theme in that song. It is the song that opens up the story." SHE SAYS: "He is suspicious of the small talk. The kids are echoing his fears. Why is she sending this letter? It is such good news; they can't believe it and they don't trust it. The twist is her saying, 'She's comin' home.' They don't trust that either. THE TRAIN: "...is the story. We find out that he really didn't communicate anything to her, and she isn't coming back. Although we're getting all of this story from him, she never got any of this. If she had heard this album, she might have come home. She never saw this side of him. It gives the story a very deep resonance." LADY DAY: "I saw this woman as someone who had talent. She wanted to be an artist or a singer. He was a hometown person. His whole orientation was family and business. He was the kind of guy who really lived in Watertown. She was more restless- a more contemporary woman. She wanted to do other things. She wasn't liberated enough to tell him, and she didn't think he'd understand. He was basically a good guy, but she wanted more. She abandoned her family and went for a career. The postscript was whether or not she got it and was it worth it." "My partner, Frankie (Valli)...made the suggestion that Frank and I should meet and talk about doing something contemporary, something maybe a little different and unusual, something he hadn't done before. I was out in Vegas for a couple of weeks and went to see all of Frank's shows. We hung out, but it was about a year or year and a half before the writing and recording. "To launch the project, we had envisioned a one-man TV show. Jake (Holmes) and I discussed what would be an interesting thing to do for Sinatra. What we could do that he hadn't done before. We just hit on putting him in a small town. Having a small-town approach and taking it down as much as we could to basic life in Middle America. We tried to strip all of the gloss and sheen off of it. We were asked to come up with something unusual, something different, a concept album if you will. I did a demo record for Frank. Then Sarge (Weiss) called and said, 'He wants to do all of them.' Apparently, Frank was just expecting to get ten or so songs. I don't think he was expecting it to be what it was, which was a story. He fell in love with something. I don't think he looked at it as being contemporary commercial. It was pretty obvious that it wasn't one hit song after another. I didn't want it to be like every other album that Sinatra had done. I felt that the songs needed to be treated a little more introspectively. Like the character. This was a man in a small town- a very simple, unfortunate slice of life. I wanted to create as haunting a sound as possible...it does have a lot of space, and air, and unusual things. Raw is a perfect description for Frank's interpretations. I had asked Frank to overdub. It was such a unique sound for him. I felt we needed tight controls. Overdubbing gave us that aspect. He wasn't all that comfortable with the concept, but he agreed to do it. He didn't feel he was in his best voice for some of the sessions, but he just forged ahead until he got it right. To be honest, I was astonished by the results. Frank loved it (the final product)." O'Brien asks why FS didn't follow up with the TV special. Gaudio's response: "He just wasn't happy with his singing at the time and he didn't want to do any television or films. He made very few personal appearances. Unfortunately, he didn't want to hold the album back. In retrospect, we would have been better off sitting on it for as long as it took. We needed a launching pad and never got it." Sinatra's visit to London this week [May 1970] and the release of his new album [Jake Holmes]has focused attention on the talents of Jake Holmes, the young Californian singer composer responsible for the lyrics of "Watertown." Holmes has been here for the past few weeks promoting his own album which Polydor have just released. During his stay he talked about his career and how he got to write the somewhat controversial lyrics for the Guv'nor's latest album. "I started writing about ten years ago . . . I was writing comedy songs with a girl called Kay Reynolds who I used to do a folk act with. That lasted for about two and a half to three years before I decided it was better to be rich than ethnic! "I went back to performing as a single and worked with Joan Rivers who had her own television show in which she did a pop comedy revue type thing, where I was always the straight man for them. "That lasted for about a year and I did some work on my own for a while before finally deciding that I wasn't getting anywhere by working so I stopped work and began to write. My manager at the time was handling the Four Seasons who wanted to change their image. "Bob Gaudio wrote [actually, Jake wrote it] them a song called 'Genuine Imitation Life' which was recorded here by Jackie Lomax. We did an album together for them which was 'Genuine Imitation Life Gazette' which was a little too esoteric for them, I think." Although the album wasn't a tremendous success for the Four Seasons, it earned Gaudio and Jake a reputation which led to the Sinatra album. "Frankie Valli took the Seasons album to Sinatra about a year-and-half to two years ago, he liked it and asked Bob and myself to write an album for him. "It took us about a year to write it. Sinatra didn't know we were going to do a concept album but we didn't want to write a rock and roll album for him and we didn't want to do something like 'Frank Sinatra Sings Jake Holmes and Bob Gaudio' so we tried the concept." The lyric tells of a man whose wife leaves him for another man and goes off to live in a strange city where she has twins. A story based on Sinatra's relationship with Mia Farrow. "I think he liked it very much although I was never an eye witness at the recording sessions where he wanted to be alone apart from the engineers on the session. I don't think he didn't like the lyrics . . . he sang the songs with a lot of feeling." The Sinatra album has established Holmes as a writer. His own album, recorded last summer in Nashville, establishes him as a singer of ability too. "The Sinatra album was a great education. Learning to write for someone else is harder, it makes you stretch out. I'd like to write for other people too especially Tom Jones and Elvis Presley." [SOURCE: Melody Maker 45 (May 9, 1970), p. 10.